Find resources to prepare for the Postal Service exam, with study guides, practice tests, agency information and more. A job candidate with the US Postal Service may have to take the Postal Exam prior to being hired. 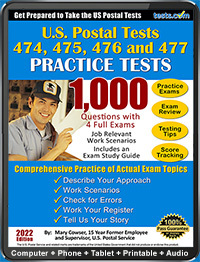 For more information, see Tests.com's Postal Service Exam Guide. Entry-level candidates seeking employment with the United States Postal Service must take the 473 Exam. It evaluates one's general aptitudes and personal characteristics, not knowledge of postal subjects. 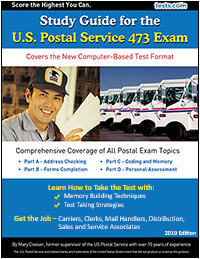 To learn more about the USPS 473 Exam, see the Postal Service Exam Guide.